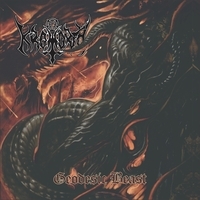 Brazilian Death Metal band, KROMORTH, originally formed in 1999. After the band broke up in 2014, they got back together again in 2015 and have been active ever since. They have recorded a total of two albums so far, "In The Name Of Kutulu" which was released in 2000, and their newest release, "Geodesic Beast" which came out in 2018. "Geodesic Beast" is the first track on the album. It has an atmospheric intro which leads to fast-paced percussion and equally fast guitar riffs. The vocal performance is very similar to early SEPULTURA or even KRISIUN. The speed of the song is nearly insane. I ended up feeling as if I was driving the down the road with the accelerator mashed to the floor. Great song! Track two, "Human Deception," starts out sounding quite a bit like the previous song. I was disappointed at first, but there is a pretty decent guitar solo featured on the track which made up for it a little. A nice song, but not very exceptional. As track three, "Kromorthian Warrior" starts I notice a distinct pattern that alarms me. How can the intro sound so much like the other two songs? Again, a nice guitar solo or two is featured, but that background music keeps distracting me. What is going on? I have a sneaking suspicion where this might be going. I start to play track 4. It too sounds a lot like the previous songs. Surely I cannot hearing this right, I think. So I try the fifth song, then the sixth, seventh, eighth, ninth, tenth….eleventh, and finally the very last song on the album. I am so sorry to say this, but all of them sounded more or less THE SAME. I have never encountered that type of thing on album before. To say that it angered me was an understatement. I felt insulted as a music fan because the message I got was that the band just did not care enough to try that hard. That being the case, why even waste everyone's time with an album? That's what this review turned out to be; just one big waste of time. I cannot and will NOT recommend this album. Save your money for something else, you'll thank me.